I CAN HELP YOUR IDEAS COME TO LIVE – AS GRAPHIC DESIGNS OR WEBSITE/BLOG. 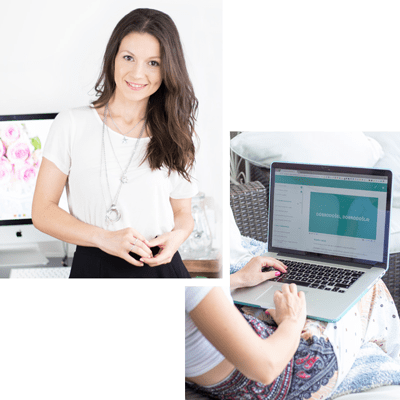 Whether you’re launching your first website, blog or need a new brand identity, logo, icons, book, business card, promo materials, invitations, templates or just how to be more organized and productive… I’m here to help you. I BELIEVE EVERYONE SHOULD DO WHAT THEY ENJOY AND ARE GOOD AT. AND OTHER STUFF LEAVES TO OTHERS. I studied and finished a master degree in social informatics and then worked in the faculty for a few years. Blog MOD (earlier Hutamanama) was my escape, my place to be creative and live my dream. I have also work on my side job and spend every hour to try to do and manage everything. To stay on track and organized was crucial. After few years I ran into a problem… I didn’t like my job anymore, I need more free time (or at least some). I wanted to live my dream, be creative, I wanted freedom, I wanted flexibility and I wanted at least to try it. I quit my job, take my part-time biz full-time. It wasn’t easy but I made it! SO WHAT CAN I HELP YOU DO? Have a brand and a graphis that will truly present you and your business.